The human temporal bone is a highly complex region. And for an otolaryngology resident, the various structures at risk don’t make it any easier. Voxel-Man Tempo is a unique training simulator for temporal bone surgery. It allows for realistic handling of the drill and a suction, and is ideally suited to gain a thorough understanding of the surgical approaches. 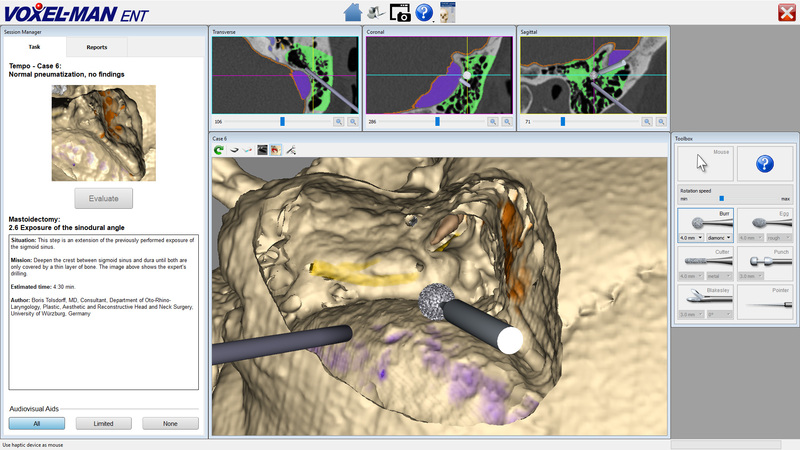 Patient and instruments are modeled in high resolution inside a computer, and visualized on a 3D screen. Using techniques of virtual reality and robotics, it provides a look and feel close to the real procedure. The system is based on virtual 3D models, derived from high-resolution CT data. The handpiece is represented by a force feedback device, which can be moved freely in space and provides very realistic haptic sensations. With Voxel-Man Tempo, you can actually feel the subtle differences between the different structures of the mastoid bone. Surgical instruments include a selection of metal and diamond burs of different sizes, which are activated by a foot pedal. A suction allows for two-handed training. At any time, the surgical site may be viewed from all sides and magnified as desired. A virtual surgical navigation system is permanently tracking the movements of the instruments on three orthogonal cross-sectional CT images. Voxel-Man Tempo offers a set of predefined training cases of the middle ear, with different anatomy and pathology, including a sclerotic bone and a cholesteatoma. All are based on high-resolution CT data of real cases. Each case is available as a left or right ear. Structures at risk such as facial nerve, tympanic chord, semicircular canals, vestibular labyrinth, cochlea, auditory ossicles, carotid artery, sigmoid sinus and dura, are highlighted. An optional support function provides automatic alerts when the trainee is approaching critical structures. 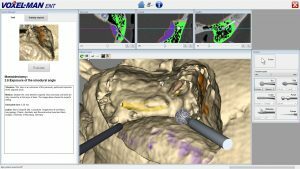 Voxel-Man Tempo provides a number of predefined tasks such as exposure of the sigmoid sinus, the short process of the incus or the facial nerve. An automatic skills assessment provides an immediate and objective feedback of the trainee’s performance. Difficulties can thus be identified and the trainee can concentrate on them. An automatic video capture of the session is available for debriefing. Instructors may visualize learning curves of individuals and groups to monitor and compare progress over time. As a step further, tutors can even define their own tasks and create master preparations, and thus use the simulator as an authoring system. And, of course, Voxel-Man Tempo shares the key advantages of all Voxel-Man surgery simulators.